Eloise Butler Wildflower Garden - Historical Bird Feeding Station. 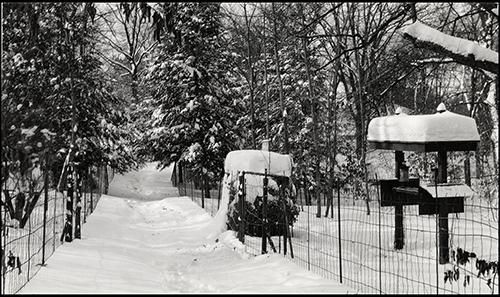 In the early 1930s, but prior to 1933, a bird feeding station was established near the grove of hemlocks at the Wild Flower Garden. (1) It was just on the northern side of the tarvia path that ran east/west which bisected the Garden at that time. On the south side of the path was the southern enclosure - containing the Woodland Garden space that we know today and on the north side of the path was the northern or "lower" enclosure that was a more open meadow of lady-slippers, birches and beginning in 1932 - Eloise Butler's Mallard Pool. 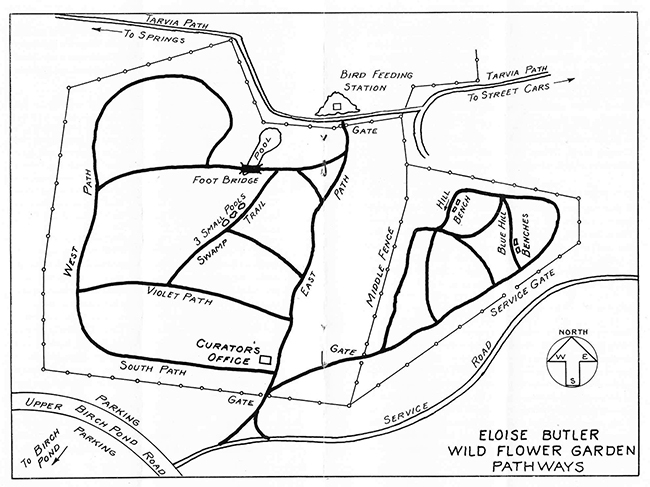 Both sides of the tarvia path as it crossed the Garden's space had a fence, first erected by Eloise Butler in 1924. For details of this fencing arrangement see this article. The photo below shows the bisecting tarvia path with fences and the bird feeding station on the northern side. The structure in the background is a storage shed. There is an access gate between the two. 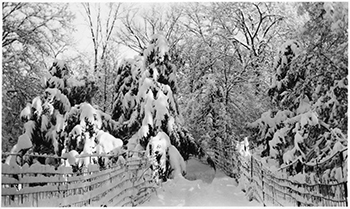 Photo Martha Crone Papers, MHS. Click on image for larger version. 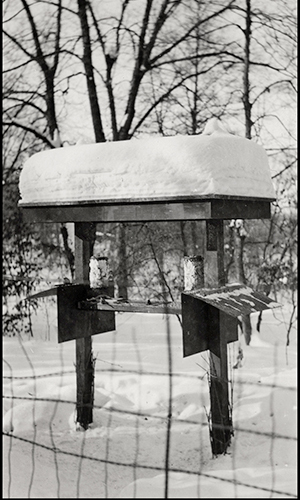 Detail of the Bird Feeding station in 1936. Photo Martha Crone Collection. By 1941 something was wrong with the station and repairs were needed. Martha Crone wrote in her diary on September 23 “Ben Johnson early and he came in to get orders for replacing Miss Aler’s bird feeding station and chest for storing food. Had a nice visit”. [ Ben Johnson was a Park Board Employee who later became Supervisor of Maintenance for the Park Board.] We do not know if the station was modified from the what the 1936 photo shows or if it was just repaired. After the northern enclosure was abandoned in 1944, a good portion of the fencing was removed. Mr. Futcher, wrote that in the 1950s the bird feeding station was fenced separately and that there was also a a large birch swale in that area that was fenced. (3) Later, he writes, the birch swale fencing was removed, he believes in the 1950s, leading to the deterioration of the area. We have photos by Martha Crone from 1948 and 1951 showing an extensive grove of birches but we do know if it is the same swale Mr. Futcher writes of or if they were in the current part of the Garden wetland. A depiction of the separate fencing in the 1950s for the bird feeding station is shown on two maps. First is Martha Crone's hand-drawn (not to scale) map used in her 1952 Self Conducted Tour Brochure. It shows the feeding station, still on the northern side of the tarvia path but now surrounded by its own fence and the fence formerly on the paths north side mostly removed. Map courtesy of J. S. Futcher. Care of the bird feeding station changed again when Ken Avery took over from Martha Crone in 1959. There was a bird feeder on a pole at the front of the Garden (south end) and Ken tended both. He occasionally made written comments about tending the feeders. In 1974 he wrote this and expresses his concern for the increased activity in the area of the Garden - and what may be the affect on the Winter birds? 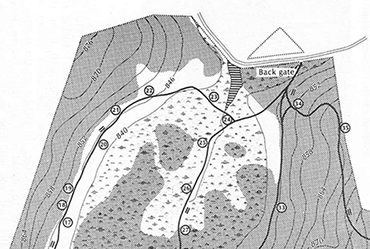 Next is the 1987 map section, of the north end of the Garden, that was used in the Garden Guidebook. This map is to scale and shows the same bird feeding placement as Crone's 1952 map. Maps below courtesy Minneapolis Park and Recreation Board. A realignment of the Garden's back fence was completed in 1992 when a new back gate design was conceived. 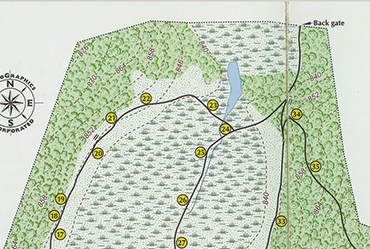 The color 2001 map shown above shows the fence realignment with the fence moved northward, creating an open area between the pool dam and the fence. The old path outside the Garden space was moved to follow the new fence line. The 1992 bird feeder. Photo G D Bebeau. With the 1992 realignment, the bird feeding station now under goes its third iteration - it was removed from the north side of the tarvia path and a new elevated bird feeder was placed inside the Garden fence. Park Board carpenters built a new rough-cedar bird feeder for both the front and back gates, and Audubon had agreed to continue winter feeding as they had done in earlier years. 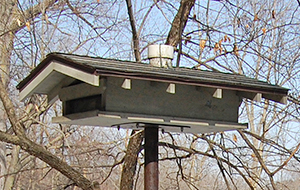 In the early 2000's those 1992 feeders were replaced with a larger model shown below which had a filler tube on the top of the roof, looking like a little chimney. But Bird feeding at both the front and back gate feeders was soon discontinued. Cary George stopped using the back gate feeder prior to 2003. Susan Wilkins, succeeding Cary in 2004, continued to use the front feeder for a few years but stopped after a few years. It was on a tall pole and access was awkward. (5) However with the wild turkey population expanding rapidly in Wirth Park, feeding would have stopped anyway as the feeders attracted them into the Garden where they created much damage. A few small feeders were still in use near the visitors shelter but those are periodically removed when turkeys come into the Garden. Back gate bird feeder - latest model. Photo G D Bebeau. Front gate bird feeder - latest model. Photo G D Bebeau. (1) Letter of Eloise Butler to Lulu May Aler, Friends archives. (2) Martha Crone's Diaries- 1933 - 1943. (3) J. S. Futcher, "A Birdwatcher's Eloise Butler," 1994 in "50 Years of Friends," published by the Friends of the Wild Flower Garden. (5) Notes from Curator Susan Wilkins - 2019.